The Balance Disc is one of the simplest balance training tools. 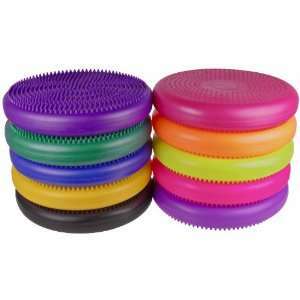 It`s a simple inflated rubber cushion with low nubs on one side and raised nubs on the other. The main advantage is that it`s really small (you can take it with you wherever you go) and cheap but still provide good training possibilities. Balance discs have a dual use: to provide an unstable surface for exercises like push-ups – or – for sitting to give you similar effect as the large exercise ball. When used on the floor for exercising it improves balance and strength. And you can also support and challenge your spinal muscles by using it on a chair.